On December 3rd, delegations from all over the world will convene in Katowice, Poland for the 24th Conference of the Parties to the United Nations Framework Convention on Climate Change, aka COP24. Their goal will be to reach an agreement on the roadmap for implementing the Paris Agreement. Here’s the problem: Not only is this task difficult given the need to reach a consensus among 190 countries, but even if this consensus is reached the commitments made under the Paris Agreement are not sufficient to meet the target of limiting global warming to 1.5°C. In other words, whatever the outcome of the COP24 is, it is just not going to be good enough. So what can we do about it? We have two options: The first is to assume the participants in COP24 know what they’re doing and hope for the best. The second is to look for new strategies to fight climate change effectively. We go with the second option because we believe that the first one is a recipe for failure. We see COP24 as an opportunity to start a serious conversation about how we make a 1.5°C limit possible with young people who are not afraid to ask critical questions, are not bounded by political and economic constraints, and are willing to take bold action! This is why we’re inviting students and faculty to join us on December 3rd, the first day of COP24 for an evening of pizza, tattoos, tea & biscuits and the opportunity to shape the most important fight we have: Climate Change. 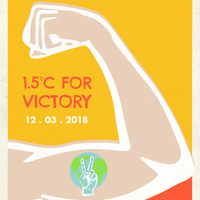 More details about the campaign are available at www.sandboxzero.co/victory.